Page Six wants to know if Kate Bosworth and Orlando Bloom are getting married soon. Hmm... and I want to know if JC Chasez is coming out with a new solo album this winter. Please find out Page Six oh pleaseeeee. Okay I didn't know that anyone actually cared about Kate Bosworth and Orlando Bloom. I mean maybe you care if you liked the movies Blue Crush and Win a Date with Tad Hamilton but marriage gossip about those two leads me to want to chug a bottle of NyQuil, pour myself a tall glass of bourbon and watch Pirates of the Caribbean with my clothes off. Okay maybe chugging the bottle of NyQuil is a bit much........I'll just sip it. I didn't realize that Jude Law was loaning out his scarf collection to Orlando. that scarf is a scary warning sign. I'm so sad now. why is his face so yellow? I think Bloomie is trying to end the long running feud betweem the navy and the and the army. Hence his ensamble of nautical scarf and army loving hat. Do celebrities get married for middle America? I can't imagine that anyone else anywhere else cares which celbrity marries which other celebrity at this point. I think we realize it is just a ploy for the most part for press and to try and stay relevant. I have been scarred too often by Paris and Kimberlys on and off again trickeries. they will get married then get divorced six months later like the rest. They broke up months ago, because Orlie was hanging out with Kirsten. Then Kate said, "You can keep him." Both must need to re-energize their careers or something. Or maybe Orlando's just getting a head start on trying to generate interest for the up and coming PoC2 movie? 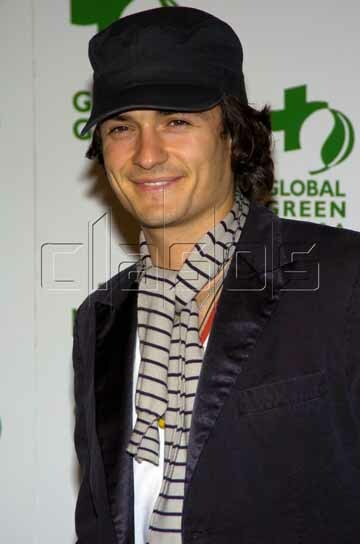 And, is Orli channeling Jude with the nanny shagging scarf?